This was an ending “shime” 〆 dish for our impromptu Hanami 花見. Because the weather has been quite warm, in our herb garden, garlic chives started poking out. With a short ceremony we conducted the first harvest of the year. Since I had these fresh home grown garlic chives or “nira” ニラ, I decided to make this “starchy” pancake as an ending dish. This is a sort of Japanese style savory pancake or Johnny cake. This is also considered as a type of “okonomiyaki” お好み焼き and anything goes but this was what I made. Batter: I used a mixture of AP (all purpose) flour (3 tbs) and finely milled rice flour or “jou-shinko” 上新粉* (2 tbs). *Rice flour can be rather coarsely ground (which I use for a dredging to deep fry or “karaage” 唐揚げ to make the crust crisper) or finely milled like this one called “Joushinko”. 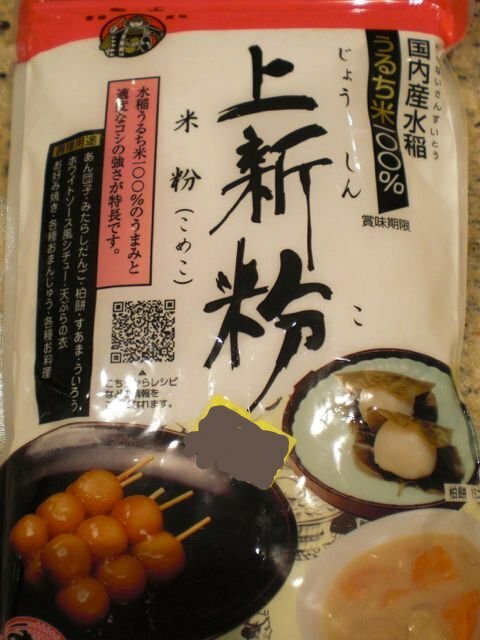 This finely milled rice flour is usually used to make Japanese sweets as you can see on the pictures of this package on the left. Adding the rice flour to the batter will give the end product a more elastic texture or “mochi-mochi” mouth feel as Japanese would say. This is optional and you could use only wheat flour for this dish or if you are in gluten avoidance mode, use 100% rice flour. I mixed in a beaten egg (one large), and chicken stock (or water or dashi) (about 4 tbs) to make a batter similar in consistency of regular pancake batter. Vegetables: I cut the garlic chives into 1 inch segments (about 1/4 cup or whatever amount I harvested) and scallions (3, sliced on slant including the green parts). Dried shrimp: I could have used chopped up shrimp or other forms of protein but I decided to use dried (and frozen) “Sakura-ebi” 桜海老 or cherry blossom shrimp (about 4 tbs). For one thing, I used them without thawing which was much easier than thawing regular shrimp and cutthing them up. These shrimp are also appropriate for cherry blossom gazing. I mixed them all together and seasoned with soy sauce (about 1 tsp) and mirin (2-3 tsp). I added dark sesame oil (1 tbs) in a non-stick frying pan on medium-low heat and spooned enough of the batter mixture to make several oval pancakes a few inches wide . After one side was set and browned (1 minute or so) , I flipped it over and cooked the other side (one more minute). I flipped it again and brushed on soy sauce. I flipped it several more times until both sides were coated with soy sauce and the soy sauce became fragrant. Obviously I overcooked it and my pancakes got a bit too dark. Our garlic chives, first harvest, were nicely tender. With rather strong tasting sakura-ebi, the combination of garlic chives and scallion went well. For most people, this dish may not have been enough but we were quite full at this point. By the time we finished this dish, it was getting dark and cold. We retreated indoors, turned on the outside flood lights and kept admiring the cherry blossoms.